This episode provide some basic description of colloids as will as some myths. In this episode we talk about the results of the CRASH-2 trial published in Lancet. This trial showed that the EARLY use of Tranexamic acid may improve survivial, but delayed use may be associated with an increased mortality. If you are using ultrasound to evaluate IVC diamter in children, what is considered a normal IVC diameter? You can determine the IVC/Ao ratio or correct the IVC diamter based on the child's body surface area. This is a condition that mimics acute coronary syndrome (ACS) that may be caused by acute emotional or physical stress. Patient's may appear to have profound cardiogenic shock, but these patients have a very high survivial rate with little more than supportive care. This episode discusses the pathophysiology, presentation, and treatment of NTSI. A brief description on what to consider when confronted with a patient with an air leak from the ET tube or a patient that self-extubates. A description of the risk factors, diagnosis, and treatment of PE. Smoke Inhalation injuries can be deadly. This episode explains why smoke can be so deadly, and how to care for those patients with suspected smoke inhalation injuries. Propofol Related Infusion Syndrome is a potentially fatal complication of propofol. If you use this common ICU drug you need this information. Wedge or PAOP is perhaps the most quoted and poorly understood variable generated by a Swan-Ganz. The most helpful number for me on a Swan is the SvO2. This is a brief description of how I use this variable in evaluating critically ill and injured patients. Therapeutic hypothermia after cardiac arrest is part of ACLS and is used by several EMS agencies around the US. Despite good data and improved patient outcomes, many providers fail to used this modality. This podcast will focus on a presentation of the data, methods of cooling, and potential complications. This is the third in the series on severe pancreatitis and necrotizing pancreatitis. This episode reviews the indications for surgery, morbidity and mortality of surgery, and what are the surgical options. A brief discussion of the considerations of ICU care of the patient with severe pancreatitis, fluid resuscitation, respiratory, renal, and nutrition. This is an initial presentation of the causes and diagnosis of acute pancreatitis. All the recent emphasis on venous catheter infections has been on central lines. Those peripheral IVs are also dangerous. Acute Colonic Pseudoobstruction (ACPO) is commonly called Ogilvies Syndrome. ACPO presents massive dilation in critically ill patients, and might result in invasive procedures to avoid ischemia or perforation of the colon. A brief summary of what are hemoglobin based oxygen carriers (HBOC) and where are they in development. What horrible things can happen with central lines once they have been inserted. A discussion of the potential problems encountered while inserting central venous catheters. Ingestion of caustic materials can be fatal and difficult to evaluate. These patients are often referred to our burn center. An introduction to the basic science in fluids used to treat hypovolemia. This episode is a discussion about how to approach an arterial blood gas result. This is an interview that I did on www.medtalknetwork.com with Dr. Brian Cotton. Dr. Cotton recently left Vanderbilt to take a new position at UT Houston. 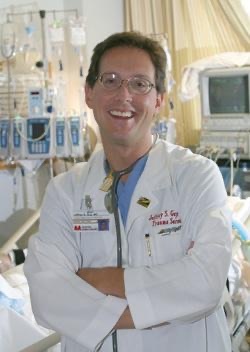 He is an excellent teacher and his opinions on fluids resuscitation are cutting edge. When and how can providing a starving patient nutrition be potentially deadly. Understanding the root cause of hypoxia will allow for more appropriate treatment. Evaluation and treatment of elevated serum sodium is presented. Hyponatremia or a low serum sodium is a common electrolyte problem that is dangerous if ignored or treated improperly. Following the recent crash of the US Airways in the Hudson River, it is an appropriate time to discuss the clinical manifestations and treatment of hypothermia. Hyperkalemia is a very common and potentially dangerous electrolyte disorder that commonly occurs in ICU patients. A brief discussion regarding some of the commonly used values obtained from a pulmonary artery catheter. Therapeutic Hypothermia following cardiac arrest has been demonstrated to improve outcomes. Starting Jan 1, 2009 Ney York City EMS will dorect patients to those hospitals able to delivery such care. This episode explores what is needed to make surgery safer for the patient with cardiovascular disease. Tight glucose control has been widely introduced into critical care. This meta-analysis, recently published in JAMA, critically evaluates the effects of these trials in reduction of sepsis as well as mortality. The results might surprise you. Myocardial Infaction (Part 1): This episode will discuss the diagnosis of MI, STEMI, and non-STEMI. We then discuss the indications and types of thrombolytic agents. The management of pain is a key element of the care of all patients-- ICU or not. Often providers have little understanding of the concepts and medications of pain management. This episode serves as an introduction. A potentiallylife-threatening electrolyte problem that commonly finds its way into the ICU as well as on exams. In regards to ventilator care, all the focus has been on low tidal volume and level of peak inspiratory pressure. What level of PEEP shoud we be using to avoid shear trauma and ventilatory induced lung injury. A limb-threatening complication that might be overlooked by the inexperienced provider. We continue our discussion of the Surviving Sepsis Campaign (SSC). This includes fluids types, steroids, rhAPC (Xigris), and blood sugar control. The Surviving Sepsis Campaign (SSC) is concensus document that attempts to provide the best evidence to assist in the care of the septic patient. All providers who provide care to the septic patient should be aware of the contents of the SSC. In this week's Journal of the American Medical Association a meta-analysis was published that concluded that use of hemoglobin based blood substitutes result in an increased morbidity and mortality. Included in the same journal is an editorial critical of the method the research has been regulated by the US FDA. Glucometers in the ICU: how accurate are they? There is a large emphasis on intensive control of blood glucose in the ICU, but how accurate are the monitors we use to follow glucose? This episode reviews someof the limitations of deploying an instrument designed for control of outpatient diabetes management to tight control of blood glucose in the ICU. Clostridium difficile colitis is a problematic complication of antibiotic theraoy in hospitalized and critically ill patients. It is increasing in frequency and can be lethal. Fluid resuscitation done poorly can result in significant complications to the patient. This episode will present some of the newer considerations in fluid resuscitation in traumatic shock. Patients are often admitted to the ICU with an entire list of home medications. In this episode I talk about the implications and dangers of polypharmacy. The results of the CORTICUS trial are discussed. Atrial fibrillation is a common problem in ICU patients, but it is a problem with many potential causes, and not always a well defined treatment. Pediatric burns: all burns are serious, both big and small. This episode reviews the objectives of burn care to result in the best functional outcome. Also, burn is a very common method of child abuse and we detail how these children are injured and what to look for to identify possible abuse. This is a basic introduction of some of the drugs used in various forms of shock. In this episode we discuss that ICU care of the patient with sepsis. This includes an introduction to various vasopressors. Large numbers of patients in ICUs are on heparin and what is this complication of heparin induced thrombocytopenia? The onset of cold weather will bring with it an increase in structure fires. The leading cause of deaths in fires is complications from the inhalation of smoke-- not burns. Learn why smoke is so deadly as well as what are the appropriate methods to treat smoke related asphyxiation. Blood products: pRBCs, fresh frozen plasma, platelets, cryoprecipitate when and how should we use it? What are the risks? You may order them like IV fluids but do you really know how these potentially deadly products are to be used. Earthquakes are horrible natural events causing loss of lives in the thousands. Following earthquakes, building collapses, and cave-ins, large number of victims will suffer from renal failure and death following crush syndrome. An introduction of the biology of thermal injuries and the initial care of the patient with thermal injuries in critical condition. A common problem in the ill or injured patient is a metabolic acidosis. In this episode we will review the common etiology of a metabolic acidosis as well as some lesser known causes. Early surgical excision is likely to be the most significant individual variable to imporve the outcome of a patient (adult or child) with a critical burn. Nevertheless, many nonburn physicians still want to apply to 1970 treatment paradigms to this population of injured patients. This episode will hopefull replace these falsehoods with fact supported in the literature. Not feeding an injured or ill patient is not that same as a normal individual who is fasting. A pound of weight loss in the stress patient is significantly different than a pound of weight loss in someone on a diet. A basic understanding of stress metabolism is needed prior to a discussion of nutrition. Excessive fluid resuscitations lead to horrible complications such as abdominal compartment syndrome. This article takes a critical look and challanges many of our practices in fluid resuscitation of burn patients. Intraosseous vascular access was was developed for use in adult trauma patients over 80 years ago. Only recently has this technique regained popularity for rapid and safe access to the vascular space in patients in extremis. Don't wean people from their ventilators-- liberate them!! When are people ready to come off the ventilator? What are weaning parameters? How does one do a spontaneous weaning trial? What is the role of noninvasive ventilation (NIV)? Acute renal failure is a dreaded complication in the ICU. This podcast will review the various types of acute renal failure, the etiology, as well as acute management. Airway Pressure Release Ventilation (APRV) or BiVent: What the heck is this? Airway pressure release ventilation (APRV) is not a new mode of mechanical ventilation, but it seems to be gaining a great deal of popularity lately. Many people find this mode very complicated and thick that it is reserved only for the very ill. Neither one of these assumptions are corrrect. This mode is very easy to learn and use. Furthermore, this mode is very physiological and tolerated by all types of patients. Glutamine In Critical Illness: what's all the fuss about? A discussion of ventilation, oxygenation, and the role of PEEP. What is the role of decadron in preventing post extubation stridor? What is the role of giving an adult steroids to prevent stridor or reintubation following extubation. This epidose looks at the data.